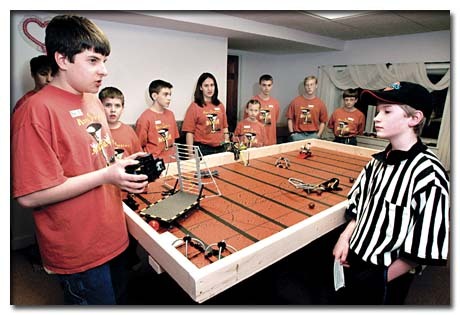 Ben Streeter, left, makes an adjustment to the team�s robot while referee David Schunemann, right, and the rest of the Mindstorms Mayhem team look on. MILFORD—Most kids play with LEGOS, but not many build and program LEGO robots to solve problems encountered by NASA scientists and engineers. But 10 young people from Milford, Wilton, Merrimack, Hollis and Bedford have done just that. And as a result of winning the state FIRST LEGO League meet in December, they have been invited to an international robot competition. The 10 kids are a group of home-schooled students, and this is only their second year as a team, which they call Mindstorms Mayhem. Mindstorms Mayhem started in 2002 when coach Bill Gray of Milford and coach Ken Streeter of Bedford decided to teach a group of home school students who knew each other from church about LEGOs, robots and programming. Team members are Nathan and Melissa Gray of Milford, Ben and Jacob Krupkin of Milford, Victoria and Dan Umenhofer of Wilton, David Schunemann of Hollis, Ben and Nathan Streeter of Bedford and Brian Jennings of Merrimack. Christopher Jennings of Merrimack graduated from the team last year and became the young adult mentor. Members of the Mindstorms Mayhem LEGOs watch their robot do its thing. From left, Brian Jennings of Merrimack, Dan Umenhofer of Wilton, Jacob Krupkin of Milford, and Victoria Umenhofer of Wilton. This year’s competition involved building and programming a robot to solve nine missions based on problems encountered by NASA scientists and engineers in the Mars rover missions. The robots competed on two 4x8 foot tables with a mat that was a photo of Mars. The team also had to do a research presentation about power sources on Mars to be used for habitation modules. The team met twice a week from September to December at the Grays’ house to prepare for the state tournament Dec. 13, where it competed against 47 teams and won the Director’s Award for best overall performance. This guaranteed the team an invitation to represent New Hampshire at the International Invitational at the Georgia Dome in Atlanta on April 15 to 17. The team impressed their coaches at competition and throughout the year. While the team is excited to have a chance to win internationally, they know that the competition will be stiff. Being home schooled actually helped the team get past what they considered their greatest challenges: time and teamwork. One place this could be seen was in their research presentation. To present this to the competition, the team came up with the idea of a channel surfing skit that goes from rap video, to news, to talk show, all the while informing their audience about geothermal energy. 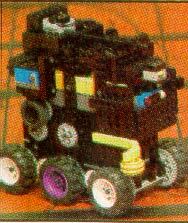 The robot is made completely of LEGOs and runs on a computer program. For Nathan Streeter learning about Mars, robotics and geothermal energy is important because he hopes to someday work for NASA. And David Schunemann wants to work with robots at MIT, and Jacob Krupkin hopes to be a software engineer. Even those that don’t plan to work in science said they like working on their problem solving and teamwork and are having fun. But the fun stops here if Mindstorms Mayhem can’t get to Atlanta. Teams must raise approximately $10,000 for transportation, lodging and food and is seeking financial support from businesses, community groups and individuals. All donations are tax deductible and BAE Systems has offered to match any gifts up to $5,000. The team will give a demonstration of their robot and research upon request. All donations should be sent to: Mindstorms Mayhem, 24 Grey Rock Road, Bedford, NH 03110. All checks should be made out to Mindstorms Mayhem / Milford School District. For more information, to make a donation, or to schedule a demonstration, go to www.mindstormsmayhem.org. FIRST LEGO League is a nonprofit partnership between Dean Kamen’s FIRST program and the LEGO Company.